Nothing says Halloween like a platter of deviled mice or some delicious maggot soup. During the witching season, our food should satisfy our macabre appetites, so why not cook up some simple spooky treats for you and your friends? 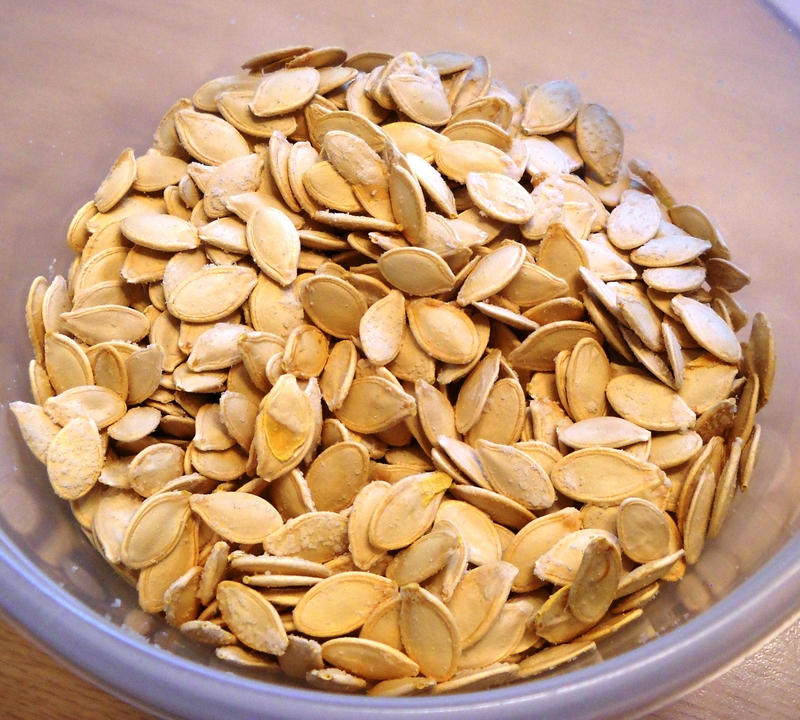 This is an easy recipe that you have no excuse not to make if you’re carving a pumpkin this year. Separate the seeds from the orange goop and rinse. Pat dry. Gently toss with olive oil and spread onto a baking sheet. Salt to taste. Bake at 350° for 20-30 minutes or until golden brown. Mix bottled cheese product with green food coloring. Dip pretzel sticks into green cheese. Process Oreos in food processor until they are fine crumbs; add cream cheese bit by bit. Process for a while and soon the mixture will start to ball up. Roll small balls and put on cookie sheet lined with waxed paper. Place sheet in freezer for 1/2 hour until frozen or firm. Melt white bark. Dip Oreo balls in white chocolate with spoon and place on sheet. Once the balls have hardened, mix blue or green food coloring with some white chocolate and paint circles onto the balls for the iris. Press a chocolate chip into the center for the pupil. Mix powdered sugar with a little water and plenty red dye. Use a toothpick to draw veins. Keep in a chilled environment. Combine the butter, sugar, egg, almond extract, and vanilla extract in a mixing bowl and beat together; gradually add the flour, baking powder, and salt, continually beating; refrigerate 20 to 30 minutes. Preheat oven to 325°. Lightly grease baking sheets. Remove dough from refrigerator in small amounts. Scoop 1 teaspoon at a time onto waxed paper. Use the waxed paper to roll the dough into a thin finger-shaped cookie. 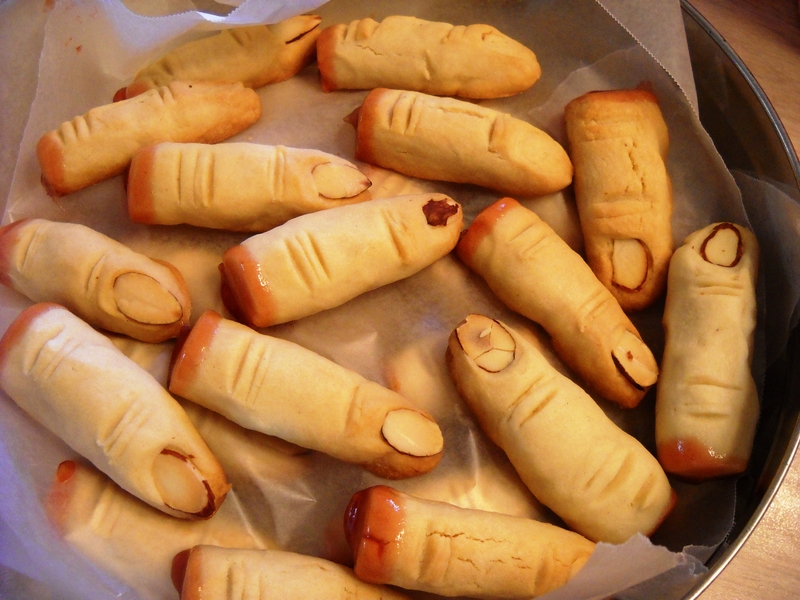 Press one almond into the end of each cookie to give the appearance of a long fingernail. Use fork tines to create lines in the middle for the knuckles. Bake until the cookies are slightly golden, 20 to 25 minutes. Smear some strawberry jelly on the end without the almond to show the blood where the fingers were severed. Body parts! Delicious body parts! Good food, good meat, good god, let’s eat! Oreo Eyeballs!! Awesome. I’m going to do that all year around. Oreo truffles/balls were already one of my favorite desserts. 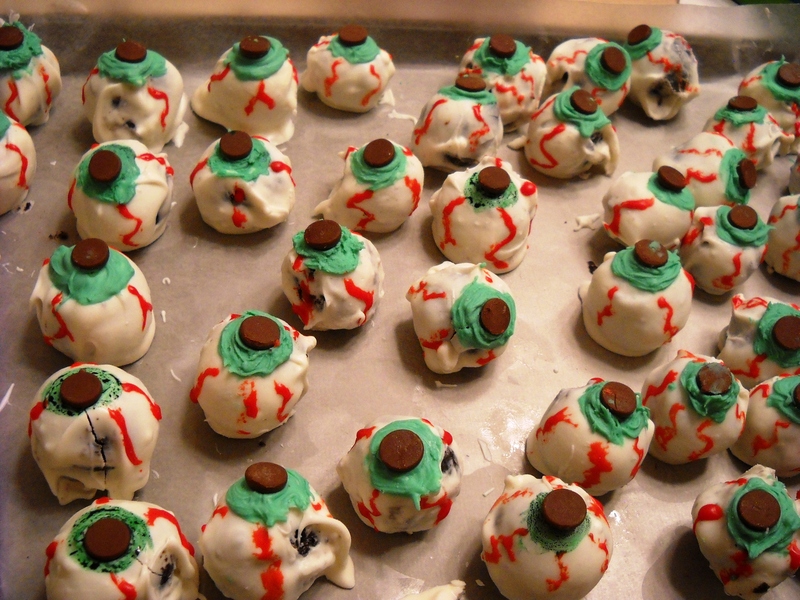 And now that you’ve made me privy to the creepy aesthetics every occasion shall have Oreo Eyeballs if I am called upon to bring a dish, whether it be Christmas, a family reunion, a baby shower, or Halloween. Love this recipe for Witch’s fingers! It’s a tried and true “tea cake” recipe from my childhood – I called the “dough cookies” – can make just about anything with them. Happy Halloween and Coffin Hop to you! My own favorite recipe: make a white box cake mix, separate batter into two equal portions. Bake one pan white, bake the other pan with green food color mixed in for green cake. Once baked, cool then crumble cakes and mix together. Serve in a CLEAN UNUSED cat litter box. For garnish, take tootsie rolls and roll them out into long lumpy things and bury all throughout cake mix. Serve with chocolate pudding, using a litter box scoop. I love it! That’s a really creative idea, and it sounds tasty. Maybe I’ll try that next Halloween! They all sound ghoulishly yummy!